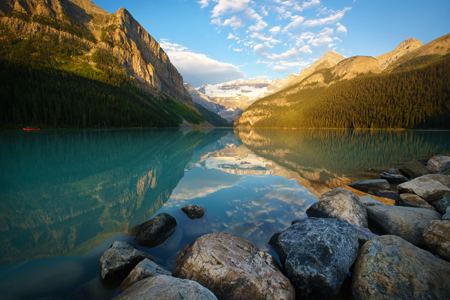 Paul Nguyen heads to Banff and Jasper national parks with his Tamron SP 15-30mm VC lens. Since he was 12 years old, Paul Nguyen has been taking pictures, inspired by his dad, an amateur photographer himself. "I was fascinated with technology and machines, and I was always pestering my father about what he was doing when he took his camera out," Paul says. "Eventually, he became fed up with all of my questions and got me my own camera." Fast-forward to the present, when Paul is shooting full-time and co-managing BlueHour Photo Ventures, which runs photo workshops across the country and internationally. "One of the tours we do is to the Canadian Rockies, taking between six and 10 people to these amazing destinations all over the world, with a complete tour experience and photo instruction at each location," he says. For his most recent trip to the Rockies, which included Banff and Jasper national parks, Paul was able to get his hands on the new Tamron SP 15-30mm VC wide-angle lens. "The sharpness of this lens was superior," he says. "As a landscape photographer, wide-angle lenses are crucial to my work, and this lens is a whole extra millimeter wider than the one I'd been using. The lens is incredibly sharp for my landscape and nighttime photography. It also has the Vibration Compensation (VC) feature to help minimize camera shake and keep my images sharp, which is critical when I'm shooting handheld in low light." Paul's photography style plays with how people see the world. "Altering perception is harnessing the different ways people see things," he explains. "The same events can happen to different people, and people will choose to see them negatively or positively, depending on their perspective. There are really only a set number of scenes that people can photograph, so why does photography continue to exist? Because there are so many ways to interpret those scenes." How he changes up this perspective is by shooting at different times. "I usually try to shoot in exceptional conditions or at night," he says. "And that wide-angle, wide-aperture Tamron lens really makes it possible for me to shoot at night much more effectively than I had been doing before. Before I started shooting with Tamron lenses, I didn't really have great capability to shoot wide open and still keep my images sharp; plus, modern sensor technology wasn't as good as it is now. With those two things in place, I can now make amazing pictures I couldn't think of doing even five years ago." Here, Paul talks about the nature photos he captured in the Canadian Rockies with the 15-30mm lens. On the first day we arrived, we took a photo of Moraine Lake—part of the Valley of the 10 Peaks in Banff—in the evening, and then another one in the middle of the night with the Milky Way above it. It's just another testament to the idea that everytime you visit a location, you'll see something different, particularly in the Canadian Rockies, and especially if you go at different times of the day. It was overcast last year when we were there, but this time the skies were clear for both the afternoon and nighttime shoots. We were treated to some spectacularly calm conditions, which allowed me to get the glassy look to the water. Meanwhile, nearby was Peyto Lake, named for an early 1900s park warden in the park. 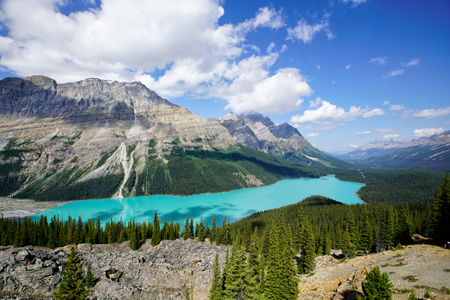 The lake is fed by nearby Peyto Glacier, and its brightly colored waters have made it a popular photography spot. The color looks different depending on when you show up: When it gets direct sunlight, it tends to look like the Caribbean blue you see here; other times it looks a much deeper blue. Last year I took a shot at night with an aurora overhead and the color of the water at that time was a deep emerald color. This particular shot was taken later in the afternoon. In the Canadian Rockies, the days are so long in the summer that even when you're there at 5 in the afternoon, like I was in this image, it feels like you're there at noon because there's so much more daylight. The time sort of messes with you when the days are that long. For this photo, it was one of those cases where I didn't feel any wind, but the clouds were moving in quickly, so every frame I was taking was different. I ended up making a time-lapse movie as well, and this was one of the frames from the time lapse. I had about 200 images to choose from, so I picked one where the clouds were placed, seemingly by hand, on top of the mountains. The whole composition leads you from the left to the right to a convergence point on the other side of the lake—the line of the pine trees at the bottom points that way, the lake points that way, the mountains point that way, and the clouds point that way. 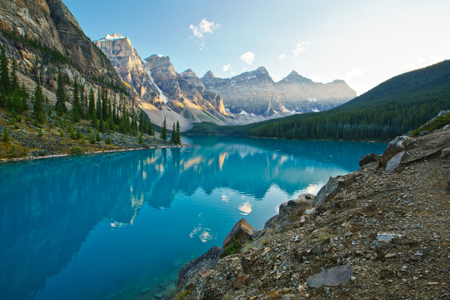 It's leading you deeper into that Valley of the 10 Peaks, which is one of the highlights of the Canadian Rockies. You can't go through Banff without visiting Lake Louise, also known as the "Lake of the Little Fishes" by the local Nakoda tribe; every time you go it's different. This photo was taken at dawn. The sun had risen behind me and lit up the Victoria Glacier, which is at the far end of the lake. Usually on photo tours we don't go back to the same place. We had taken the group to this spot the night before, and it was really dull—the water was choppy, and we thought the whole photo opportunity was a wash. But I convinced the group to go back the next morning, and we were treated to this amazing spectacle of the glacier lighting up and the water being glassy and calm, so it was the opposite of what we'd seen the night before. It proves the old adage of nature photography that patience and repetition are key. We already knew what the composition was going to be—we just needed the conditions to turn out right, and this was the morning they did. 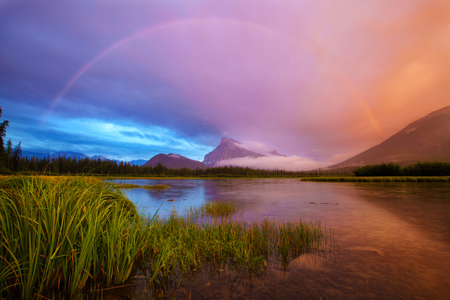 Overlooking the towns of Banff and Canmore is Mount Rundle, which reaches nearly 10,000 feet into the sky. This photo I took was one in which I was really thankful for the super-wide angle of the 15-30. I used every millimeter of the 15mm end of it. I literally zoomed all the way out, and even then the rainbow just barely fit. Going back to how images can be altered depending on perspective: If we had been there half an hour earlier, this photo would've looked nothing like this. But we persevered, and a scene that was gray and boring suddenly became a once-in-a-lifetime opportunity. My perception at that moment was changed, as were the perceptions of the people viewing the image. This was a situation in which I overrode my group and their sensibilities to go home, because it was raining like crazy all afternoon. I just had a feeling, though, that if we waited another half-hour, something amazing would happen. We took a drive looking for wildlife, then came back to this location. The sun was setting, the clouds were clearing, and there was still a little rain. We came up to this pullout where we'd spent a large part of the afternoon, and when we got out of the car, the rainbow was perched right over Mount Rundle. The moment couldn't have been more perfect. It lasted all of about five minutes before the rainbow started to fade. The conditions were changing really rapidly, with the clouds blowing through. Those clouds you see perched on Mount Rundle weren't there for very long. I got close to the ground, because I like to work the foreground into my elements, and found a composition I liked with the leaves and the pond close to me, and the rainbow off in the distance. Everything fit into the frame exactly as I needed it to. I took this photo at F/11, ISO 100, with a shutter speed of about ½ second to a second. I darkened the sky a bit in post-processing because everything was brighter in the picture than what I saw with my own eyes. By doing this, I was able to bring the tones back to the way I actually saw them in real life, with the real vibrant red, the rich blue on the right, and the rainbow looking so dense in the sky. As a nature photographer, I'll often go for a black-and-white photo when the color isn't critical to a scene. For the rainbow photo I just talked about, obviously that needed to be in color. But for a picture I took of Mistaya Canyon in Banff, I wanted to focus on the texture of the water floating in the canyon and the way the light hit the rock. Sometimes conditions dictate how you render a photo. Midday conditions, which is what I was faced with in this photo, usually look better in black and white simply because it's better to show off more contrast. Let's just say I took this image and didn't convert it to black and white in post-processing: It would've looked like the shadows were very dark and the rocks were very bright—it just doesn't work. But in black and white, you can go with much deeper shadows and much brighter highlights. 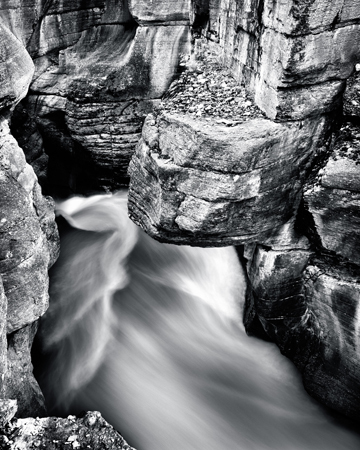 Plus, with black and white processing, I can bring out the texture of the water via a long exposure. For this image, I used a neutral-density filter and added a couple of stops to be able to slow down the shutter speed in the middle of the day. I also made the choice on the spot to shoot vertically. A vertical works here because of the height of the canyon. When I shoot vertically, I tend to crop most of my shots into a four-fifths ratio. You'll notice here I'm no longer using the camera and lens's native ratio of 3:2; I've actually cropped it to a more classical perspective because that works better for such a vertical shot. 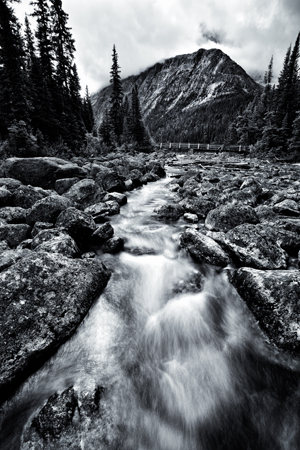 This river leads up to Mount Edith Cavell in Jasper National Park. I'd photographed from this spot last year, but I wanted to do something different this time around. Very few people actually venture down this way, because the bridge in the background is usually where people are shooting from. But a place that's difficult to get to will often give you a more original image, because most other people aren't getting that image. So I decided to walk down the river, from the bridge. I noticed the rocks in the river had arranged themselves in a way so that there was a channel cutting through the river; the water was flowing much faster through this small section here. Storm clouds were moving in, and it looked like the beautiful day was going to turn not so beautiful, but I continued shooting anyway. The rain was coming down pretty hard at this point, so I covered my camera and lens with a shower cap. I can still compose through the cap—line up my composition, level everything, and manually focus—and then I simply lift the shower cap off, take the shot, then put the shower cap back on. Hopefully I don't get too many drops on my lens in the process! Because the light was so flat, I decided to make this a black-and-white photo. The conditions were dim, so the shutter speed was naturally lengthened in this one—I didn't need to use a filter. And because I toughed it out in the bad weather, I came out of this with a shot I love. My best quality is I always stick around and don't lose patience. When everybody leaves is often when the more compelling shots emerge. To see more of Paul Nguyen's work, go to www.paulnguyenphoto.com. To learn more about Paul's photo tours and workshops, visit www.bluehourboston.com.